"Attention all recruits! 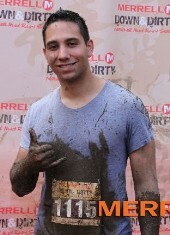 Have Fun - Get Dirty!! The Merrell Down and Dirty Mud Run in New York features 5K and 10K off-road courses filled with: Military-style Obstacles; Commanding cargo climbs; Wild water crossings; Mud, mud, and More Mud! ; Post-race BBQ and an awesome Tech Tee. Race alongside local Military personnel, Public Safety Officers and Police Academy trainees, all while supporting our troops through Operation Gratitude."